There’s something mysterious but powerful in that feeling that one has been associated in an enterprise meant to continue long beyond one’s own span of days. The period 1934–1940 is unquestionably one of the most important in the chronology of the Bliss-Tyler correspondence, and it is documented by 436 extant letters and telegrams. During this period, the Blisses worked persistently to transform Dumbarton Oaks into a center for research in Byzantine studies, thus increasing their art collecting at a staggering pace. They added over 280 Byzantine and related artworks and 44 non-Byzantine artworks to the collection—a near 140 percent increase in their holdings. The cost of these activities was, in large part, supported by the $12,386,000 estate that Mildred Barnes Bliss inherited when her mother, Anna Barnes Bliss, died in 1935.“12,386,000 Estate Left by Mrs. Bliss; Daughter Is Named Residuary Legatee of Bulk of Patent Medicine Fortune,” New York Times, June 23, 1936. In the same year, Robert Woods Bliss realized a long-held desire to visit Pre-Columbian sites and excavations in Central America, a trip that Mildred Bliss was unable to take due to her mother’s illness and eventual death. Throughout this period, the Tylers, especially Royall Tyler, remained steadfast supporters of the Blisses’ ambitions and advised not only on the acquisition of museum-quality artworks but also on the program and purpose of their embryonic research institute. The prospect of world war, however, became increasingly ominous during this period; it was a major factor in the Blisses’ accelerated pace in building their research center and, indeed, in its transfer to Harvard University in 1940. In 1938–1940, the Blisses engaged the architect Thomas T. Waterman (1900–1951) to construct library and collection pavilions to the west of the Music Room; these were fully installed with books and artworks at the inauguration of the Dumbarton Oaks Research Library and Collection on November 1, 1940. Thinking over the collections, public and private, I saw in America, what strikes me most is the general neglect and ignorance of Byzantine. If it were not for the Morgan Coll. and Library, there’d hardly be a first-rate Byz. object, outside of the Oaks. You see what I’m driving at—in fact you knew it all before I started—there’s a huge void in American collections and knowledge, and it’s the whole Byzantine realm. You’ve already done much towards filling it. It was a great joy to find the Oaks so settled, as compared with four years ago, and so nobly enriched with the things we care for. Seeing them at the Oaks, I’ve again and again had the conviction come over me that I never would have had such a thrill of happiness from them had they come to rest in any other place—even Antigny, for in the nature of things Antigny can’t be hoped to last as the Oaks may last, and there’s something mysterious but powerful in that feeling that one has been associated in an enterprise meant to continue long beyond one’s own span of days. As the depression increased and Nazism gained control of Germany we knew war was a certainty and that inevitably this country would be sucked into the cataclysm. So we faced the future squarely and decided to transfer Dumbarton Oaks to the University in 1940. To ease the wrench, we assured each other that freedom of choice is a privilege not often granted by Fate and that to give up our home at our own time to assure the long-range realization of our plan was the way of wisdom. Thus we are enjoying the transformation of Dumbarton Oaks into an institution—the only one of its particular sort in existence.Walter Muir Whitehill, Dumbarton Oaks: The History of a Georgetown House and Garden, 1800–1966 (Cambridge, Mass. : Harvard University Press, 1967), 78. 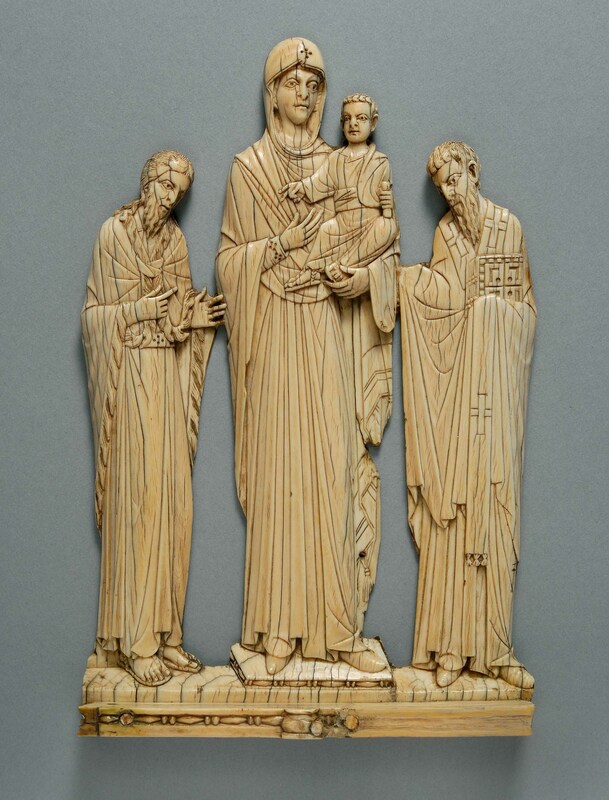 Ivory representing the Virgin Hodegetria, Saint John the Baptist, and Saint Basil (“Landau ivory”), BZ.1939.8, Byzantine Collection, Dumbarton Oaks Museum. Only I’ll go into decline if you don’t get that ivory. Especially as doubt has been cast on it. I suggested in my wire, to Robert, that he use (without mentioning names, of course) the lack of agreement on it in bargaining. He can truthfully say that some important judges in US don’t think it is Byz.—and LandauNicolas Landau (1887–1979), an antiquities dealer known as “Le prince des antiquaires.” Born in Varsovia, he studied law in Paris before becoming an antiquities dealer in New York and then in Paris, where he had a business on the rue de Duras. knows of Marquet’s rejection. It’s really a god-given piece of luck to have had it doubted, and puts you in a wonderful bargaining position. !Que lo aproveches!“Take advantage of it!” I hope Robert may be able to get it for a fraction of what was asked—but get it he must.Royall Tyler to Mildred Barnes Bliss, November 18, 1938. 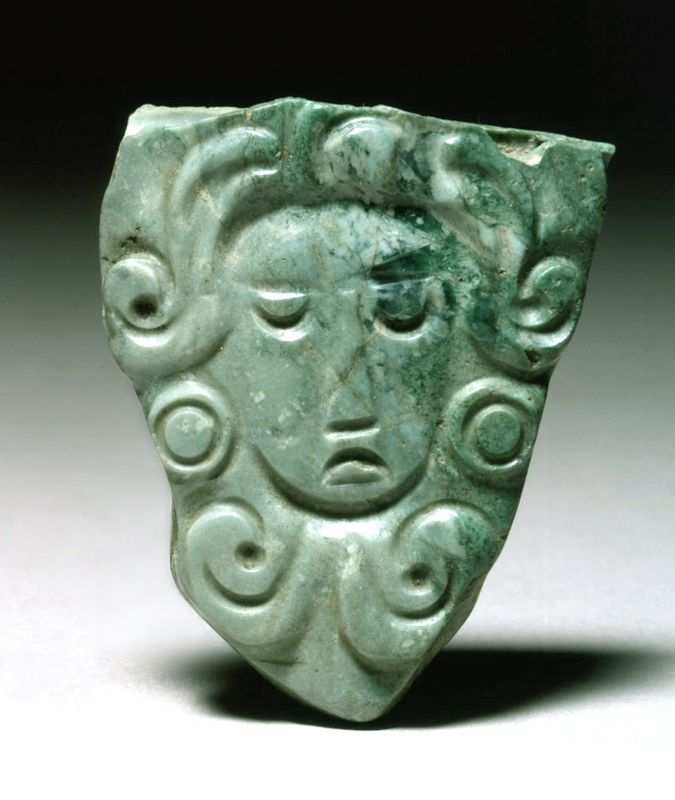 Tyler also helped Robert Bliss build his Pre-Columbian collection by acquiring several artworks from the collection of Mrs. Jean Holland that were auctioned at Sotheby’s in London on June 9, 1937.PC.B.045, PC.B.056, PC.B.100, PC.B.101, PC.B.110, PC.B.160, PC.B.161, PC.B.162, and PC.B.249. See Royall Tyler to Robert Woods Bliss, June 9, 1937 . Given that German museums were beginning to sell their artworks—a trend that could potentially be followed by church treasuries—Tyler quickly drew up a desiderata list for the Blisses. He wrote Mildred Bliss: “FritzRoyall Tyler’s slang for “Germans.” is willing to sell Byz. things at present. In your place, I’d buy as many first rate Byz. things from him as I could, even paying big prices for them.”Royall Tyler to Mildred Barnes Bliss, September 4, 1937. His recommendations of what to buy included the very best Byzantine artworks that could, conceivably, be acquired, although, in fact, the Blisses would be mostly unsuccessful in this endeavor. The Blisses realized that they needed to conserve their money and not spend it on lesser acquisitions in the hope that really important objects would be offered up for sale at a price they could afford. Robert Bliss articulated this conundrum in a letter to Royall Tyler of September 25, 1934: “Both Mildred and I feel, however, that it is better to reserve ourselves for something of greater importance that may possibly appear in the market as the times grow worse throughout the world—though there is always the fear, that as time goes on we may not have the wherewithal to purchase anything.” When the dealer Stora offered the Blisses a Hispano-Moresque “Alhambra” vase, Bliss felt that this was not “an object for us. In the first place, it costs a considerable sum, which I would rather put into a purely Byzantine object of a like quality and rarity.”Robert Woods Bliss to Royall Tyler, October 11, 1937 . Tyler agreed completely, writing: “Robert, I beg you to keep your powder-flash supplied, & not to waste any, taking shots at such small game. I really think some of the above marvels may soon come along, and. . . . I won’t waste words.”Royall Tyler to Robert Woods Bliss, December 20, 1938. 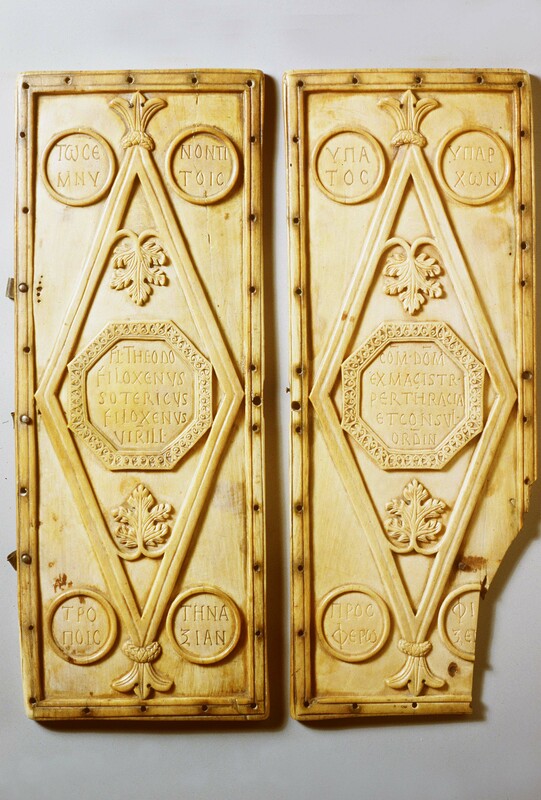 Diptych of Philoxenus, 1935.4.a–b, Byzantine Collection, Dumbarton Oaks Museum. Among the “marvels” that might come along, Tyler cited the so-called Goldene Tafel, a Byzantine gold and enamel Crucifixion icon that was in the Reiche Kapelle of the Schloss Nymphenburg in Munich. As it turned out, it was actually the property of the House of Wittelsbach,The House of Wittelsbach, a German royal family from Bavaria. Members of the family served as dukes, electors, and kings of Bavaria (1180–1918), counts palatine of the Rhine (1214–1803 and 1816–1918), margraves of Brandenburg (1323–1373), counts of Holland, Hainaut, and Zeeland (1345–1432), elector-archbishops of Cologne (1583–1761), dukes of Jülich and Berg (1614–1794/1806), kings of Sweden (1441–1448 and 1654–1720), and dukes of Bremen-Verden (1654–1719). The family also provided two holy Roman emperors (1328 and 1742), one king of the Romans (1400), two anti-kings of Bohemia (1619 and 1742), one king of Hungary (1305), one king of Denmark and Norway (1440), and a king of Greece (1832–1862). which therefore had a right to sell it. The asking price was reportedly $70,000.Royall Tyler to Robert Woods Bliss, September 25, 1934 . In making this recommendation, however, Tyler confessed: “I must add that, as a work of art, it does not greatly appeal to me. I know many smaller enamels that I consider much better. Personally, I would rather possess the BurnsWalter Spencer Morgan Burns (1891–1929), a British art collector and financier, was a nephew of J. Pierpont Morgan and a partner in his firm, J. P. Morgan and Co., as of December 31, 1897. CrossBZ.1936.20. At this time, the reliquary cross was owned by Ruth Evelyn Cavendish-Bentinck Burns, the widow of Walter Spencer Morgan Burns,. which I fancy could be bought for about one fifth of the price asked for the Goldene Tafel. However, the Goldene Tafel is such a morsel that I thought I had better tell you about it.” Not unexpectedly, the Blisses acquired the Burns enamel Crucifixion reliquary. Also, because the Blisses had been successful in acquiring the Philoxenus consular diptych,BZ.1935.4.a–b. which had come from the famed TrivulzioLuigi Alberico Trivulzio (1868–1938), Prince of Musocco and Marchese of Sesto Ulteriano. Trivulzio was responsible for the sale of much of his family’s art collection. collection in Milan, Tyler immediately added other Trivulzio treasures to his list. He wrote: “if Trivulzio is starting to sell, I think you may wish to reserve yourself for that magnificent Xe cent. Christ ivory,Christ Enthroned, Byzantine, second half of the tenth century, ivory, private collection, Switzerland. See Anthony Cutler, The Hand of the Master: Craftsmanship, Ivory, and Society in Byzantium (Ninth–Eleventh Centuries) (Princeton: Princeton University Press, 1994), 45, ills. 46 and 47. which is one of the very finest Byz. things known. It will be a big morsel & how Trivulzio will get it out of Italy I don’t know, but he may try.”Royall Tyler to Robert Woods Bliss, September 5, 1934. He later added that if things continued to come from “that quarter,” there is another sublime ivory there, the Annunciation,Annunciation, late seventh–early eighth century (? ),ivory, Civiche Raccolte d’Arte Applicata, Castello Sforzesco, Milan, inv. A.14. It was acquired from the Trivulzio Collection in 1935. The ivory has been variously dated. See Kurt Weitzmann, ed., Age of Spirituality: Late Antique and Early Christian Art, Third to Seventh Century (New York: Metropolitan Museum of Art, 1979), 198–99, no. 448; and Serena Ensoli and Eugenio La Rocca, Aurea Roma: Dalla città pagana alla città cristiana (Rome: L’Erma di Bretschneider, 2000), 590, no. 284. See also Byzantium and Islam: Age of Transition Seventh–Ninth Century, ed. Helen C. Evans with Brandie Ratliff (New York: Metropolitan Museum of Art, 2012), 46–47, no. 24H. 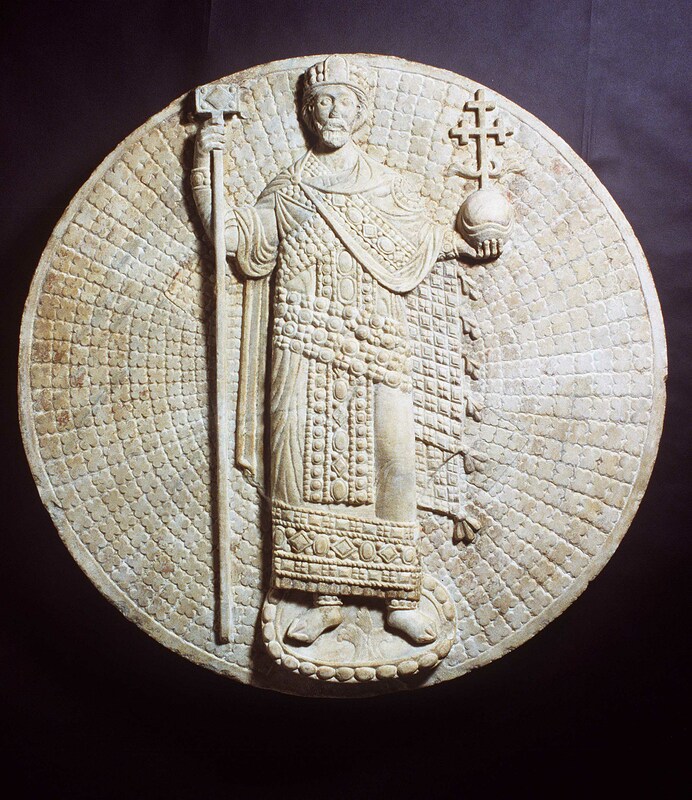 “which seems to belong to the Grado throne group.The so-called Grado Chair, a lithurgical throne given by Emperor Heraclius (reigned 610–614) to Grado, Italy, after his successful reconquest of Egypt. The chair was ornamented with carved ivory plaques. See Kurt Weitzmann, The Ivories of the So-Called Grado Chair (Washington, D.C.: Dumbarton Oaks Center for Byzantine Studies, 1972); and Byzantium and Islam: Age of Transition Seventh–Ninth Century, ed. Helen C. Evans with Brandie Ratliff (New York: Metropolitan Museum of Art, 2012), 45–50, no. 24A–N. If either of those two ever fetched loose . . .”Royall Tyler to Robert Woods Bliss, October 16, 1934. Even a half year later, Tyler was still hopeful: “The idea of your possessing the Trivulzio Annunciation excites me as much as it could if something had fetched loose out of the Cabinet des Médailles.”Royall Tyler to Robert Woods Bliss, March 9, 1935. In 1935, however, the city of Milan acquired much of the Trivulzio collection for the Civiche Raccolte d’Arte Applicata, Castello Sforzesco. 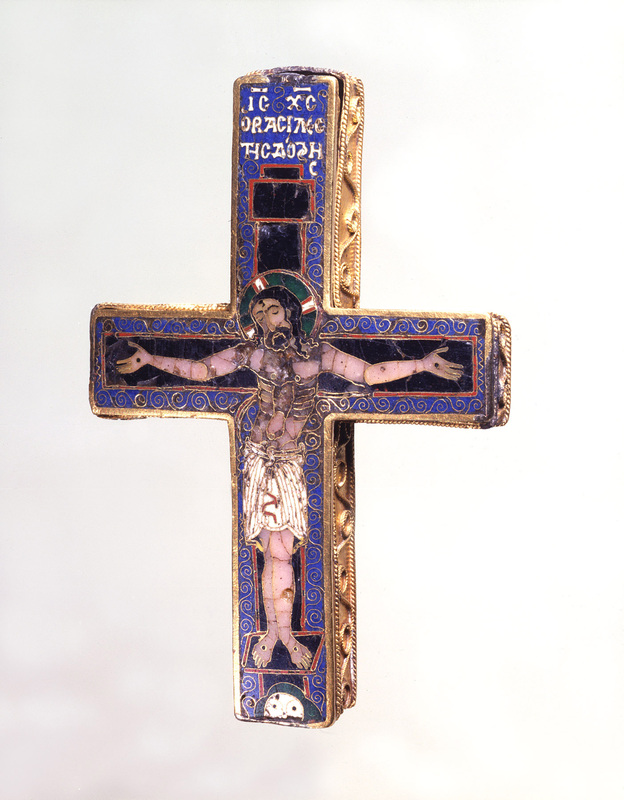 Royall Tyler also recommended that the Blisses attempt to acquire the reliquary of the True Cross (Staurotheke) in the Cathedral Museum at Limburg an der Lahn.Reliquary of the True Cross (Staurotheke), Byzantine, ca. 960, gold, gems, and enamel, Cathedral Museum, Limburg an der Lahn. He further advised trying for a lion silk in the Saint Heribert Diocesan Museum at Cologne-Deutz.Lion Silk, Byzantine, late tenth–early eleventh century, Saint Heribert Diocesan Museum, Cologne-Deutz. The twelfth-century shrine of Saint Heribert, archbishop of Cologne (d. 1021), at Saint Heribert, Cologne-Deutz, has an imperial Byzantine lion silk with an inscription suggesting a date of ca. 976–1025 for the textile. See Michael Brandt and Arne Eggebrecht, Bernward von Hildesheim und das Zeitalter der Ottonen, vol. 2 (Hildesheim, 1993), no. II-19. Most important to Tyler, however, were four Byzantine ivories.See German ivories. One of them, the diptych leaf representing a jeweled cross with the bust of Christ, was in the Stiftung Schloss Friedenstein in the Schlossmuseum at Gotha and was of particular interest because the Blisses had acquired its pendant.BZ.1937.18. The other three ivories were the left diptych panel with the Crucifixion and the Deposition in the August Kestner Museum, Hannover; its pendant, the right diptych panel with Christ meeting the Marys in the garden and the Descent into Hell in the Staatliche Kunstsammlungen, Grünes Gewölbe, Dresden; and an ivory panel representing John the Evangelist and Saint Paul in the Staatliche Kunstsammlungen, Grünes Gewölbe, Dresden. These four objects are the finest Byzantine works of art in German State possession known to me, and our Roman friend, to whom I mentioned them agrees. If you feel the same way about them, after considering the photographs, you might think it worth while to empower the Roman friend to negociate, after having agreed a maximum price with him, in the determination of which I would of course be glad to help if you wish me to do so. The Blisses would not succeed in acquiring these objects, as detailed at length in the correspondence. But using Volbach and Fiedler as agents, they would succeed in acquiring two important Byzantine sculptures that belonged to Prince Leopold of Prussia, who was living on Lake Lugano in Switzerland, having moved there from his family home, the Schloss Glienicke, in Berlin-Potsdam. One of the sculptures was a roundel,BZ.1937.23. representing an emperor. The other depicted the standing Virgin.BZ.1938.62. Fol. 136v from Greek Gospel Lectionary, BZ.1939.12, Byzantine Collection, Dumbarton Oaks Museum. The Blisses realized that their collection was deficient in significant examples of Byzantine illuminated manuscripts and coins, or, as Robert Bliss stated, “we are totally lacking in anything to represent the field of Mss. and coins, both of which are important to round out the collection.”Robert Woods Bliss to Royall Tyler, August 18, 1937. Tyler immediately took up the challenge: “As for MSS, I have some ideas, connected with Mt. Athos. There just aren’t any on the market. We’ll see if the HippiatricaHippiatrica, Byzantine, mid-tenth century, Staatsbibliothek, Berlin, Codex Phillips 1538. . . . . (!!). Coins, I also have some ideas, which we’ll talk over when we meet.”Royall Tyler to Mildred Barnes Bliss, September 4, 1937. Tyler suggested considering Thomas Whittemore’s coin collection, which eventually went to the Fogg Art Museum at Harvard University, and Hayford Peirce’s extraordinary coin collection, which Dumbarton Oaks would acquire in 1948. Referring to the latter, Tyler concluded: “Well, we’ll have to talk it over. I’ve never breathed a word to him, but I’ve often thought we might make an effort to secure that for the Oaks. It’s a grand collection, with many unica in it, and hardly any important gaps.”Royall Tyler to Mildred Barnes Bliss, September 4, 1937. The Blisses tentatively ventured into manuscript collecting by acquiring a Middle Byzantine Gospel Lectionary at a 1939 auction at Sotheby’s in New York.BZ.1939.12. Precious Mildred, I’m apalled [sic] by your list of things to be acquired. A bit reassured when you told me you didn’t want to scatter too much, and that Byz. remains the main thing. But I do beg you to consider that if you go in for all you mention in that list you’ll be in grave danger of scattering, and of getting a lot of things of no relevancy to your central subject—and perhaps even not of first quality. In truth, as you know full well, both Mildred and I are entirely of your opinion that we should keep to our Byzantine field and its allied arts, but, also agreeing with you, there are occasions when one falls from grace! We have been tempted by two objects. You may have seen one which BykPaul M. Byk (1887–1946), an employee of Arnold Seligmann, Rey & Co., New York. has brought over—a most unusual Gothic wooden Madonna seated;This sculpture has not been identified. a really very fine and unusual object. But we have resisted this one. The other is a Sassanian bronze horse,BZ.1938.12. unlike anything I have ever seen before. Of course, Brummer has it! It is fully three feet long, from rump to nostril. We are trying to resist it, and hope we shall succeed, but I do not know. Dancer or Concubine, HC.S.1937.011. (W), House Collection, Dumbarton Oaks Museum. I am glad that you acquired these two exceptional pieces. I sold them to you at your price for three reasons: first, because you and Mrs. Bliss liked them and I wanted to please you; second, I wanted to have the pride of seeing two other most important objects added to your collection containing already several other first class objects purchased from me; and third, I wanted to hurt myself by making a sacrifice on the price so that I should remember the hardship caused to me by relatives towards whom I had been generous.Kelekian was at the time involved in litigation with his nephew. However, I am a good sport and can stand losses. My only wish is that, since you have such good taste and knowledge, you should not pay attention to the advice of ambulant, so-called experts who are far from being disinterested!House Collection files, Dikran Kelekian correspondence, Dumbarton Oaks Archives. Kelek is disgusted with me for having crabbed his RouaultHC.P.1938.04.(O). to you—and I think he suspects me of having instigated Robert to screw him down on the little ivory portraitProbably BZ.1938.63, an ivory statuette of the seated Ares, which Tyler compared to their mutual friend, Hayford Peirce. of Hayford at the ring-side. He little knows how I bullied you to get it—not good for him to know it. But Royall Tyler understood, perhaps better than anyone else at the time, that the Blisses were first and foremost impassioned collectors. When they wrote him of their interest in a Romano-Egyptian glazed ceramic vaseBZ.1939.31. that they had long wanted to acquire from Kelekian, he wrote back half-heartedly: “I grieve that you should be lured by the old Egypt. thing—but I know what it feels like, and who am I . . . ”Royall Tyler to Mildred Barnes Bliss, November 18, 1938. What can I say about the internat. situation? It certainly looks much nearer a crash than it has been since the last world war. I may be mad, however, but I’m still inclined to think the crash may not take place. A quick decision, in the event of war, isn’t likely, and without a quick decision the totalitarian states are almost certain to be beaten. I don’t think the German soldier wants to risk it (twice in 25 years—des Guten zu viel“Too much of a good thing.”), nor the Italian. How the crisis is going to develop, Heaven knows: perhaps in some way that may astounish [sic] us all. What news Gogo? What status Volbach? Avoiding post and telegraph. Convey Doro six months invitation lecture universities bringing wife for work Dumbarton. If without funds advance necessary for journey. If affidavit or university papers required cable me naming consulate having jurisdiction. Also convey BeeBee suggestion he transfer TattiVilla I Tatti, the home of Mary and Bernard Berenson near Florence. As early as 1915, Berenson expressed his intention to leave his house and library to Harvard University, and this intention was reaffirmed in 1937. Harvard only formally accepted the bequest at the time of Berenson’s death in 1959. to University now making financial arrangements later. Also of deep concern in the Bliss-Tyler correspondence were the deteriorating conditions in Soviet Russia, the Spanish Civil War (1936–1939), and what they perceived as the threat of the rise of Communism in the Western world. Tyler, who had traveled in Russia, the Ukraine, and Estonia in August 1935 and who had written the Blisses a long and impassioned narrative of his experience of Russia, its people, and, not surprisingly, its art,Royall Tyler to Mildred Barnes Bliss, August 1, 1935. wrote a year later a strictly political appraisal:Royall Tyler to Mildred Barnes Bliss, September 8, 1936. Stalin now stands out as an Oriental conqueror-tyrant on the Genghis-Khan pattern,Genghis Khan (1162?–1227), the founder and emperor of the Mongol Empire. After founding the Mongol Empire and being proclaimed “Genghis Khan,” he initiated invasions that resulted in the conquest of most of Eurasia. These campaigns were often accompanied by wholesale massacres of the civilian populations. and the mechanism he is building up in Russia has only a formal resemblance to Lenin’s Communistic State. In practice, it is much more like Old Zarist Russia, with its bureaucratization of every branch of life (even actors & dancers are State officials, distributed neatly along a cut-&-dried scale of rank & payment.) If this tendency is destined to prevail in Russia, & all present signs point that way, the effect on Communism in France & elsewhere may be enormous. The doctrinaire Communist can hardly go on looking to Russia for guidance, Russia may shortly again figure as the ideal of the reactionary, and in this capacity rival Nazi Germany. Then what? Robert Woods Bliss in Guatemalan Highlands, 1935, PC.RWB.1935.154, Pre-Columbian Collection, Dumbarton Oaks Museum. Our Central American trip is all set. We were to have left today but the pressure here was so great that we have to postpone it for a week. We, (that is, ex-Senator Fred WalcottFrederic Collin Walcott (1869–1949), a U.S. senator from Connecticut (1929–1935). He also served as regent of the Smithsonian Institution from 1941 to 1948. At the time of the 1935 trip, Walcott was a trustee of the Carnegie Institution for Science of Washington, and it was he who made arrangements for the trip. besides Mildred and me) will go first to Yucatan, where we will join KidderAlfred Vincent Kidder (1885–1963), an American archaeologist and specialist of southwestern United States and Mesoamerican archaeology. Many of his excavations were sponsored by the Peabody Museum of Archaeology and Ethnology of Harvard University. of the Peabody Museum,The Peabody Museum of Archaeology and Ethnology, a Harvard University museum founded in 1866, is one of the oldest and largest museums focusing on anthropological material, with particularly strengths in New World ethnography and archaeology. who will be with our Santa Barbara friends, North DuaneWilliam North Duane (1869–1944), a supporter of several archaeological expeditions of the Peabody Museum of Archaeology and Ethnology. and his wife,Ethel Phelps Duane (1875–1942). and we shall see that region as thoroughly as possible, staying part of the time with MorleySylvanus Griswold Morley(1883–1948), an American archaeologist, epigrapher, and Mayanist who was noted for the extensive excavations of the Maya site of Chichen Itza that he directed on behalf of the Carnegie Institution for Science. so that I think we will make our visit there under the best possible auspices. Thence, we shall go to Guatemala and see as much of that region as possible before returning. We expect to be here about the first of April.For an outline and images of this trip, see http://museum.doaks.org/IT_1144?sid=795&x=4369&x=4370 (accessed May 21, 2015). Mildred Barnes Bliss, however, was not able to take this trip due to the illness and death of her mother, Anna Barnes Bliss, who died on February 22, 1935. Get! No. СИНОД. ΓРЕЧ. 183. A very fine Menologion (Martyrdoms). Gory scenes like those in the famous Basil II Menologion in the Vatican,Menologion of Basil II, Vaticanus graecus 1613, an eleventh-century illuminated Byzantine manuscript with 430 miniatures in the Vatican library. and of at least as fine quality. Finer than the Walters (Balt.) Menologion.The “Imperial” Menologion (W.521), Walters Art Museum, an eleventh-century illuminated collection of saints lives for the month of January that Henry Walters acquired in 1930. See Georgi R. Parpulov, “A Catalogue of the Greek Manuscripts at the Walters Art Museum,” The Journal of the Walters Art Museum 62 (2004): 83–88. In Florence, dearest Mildred, do call up my Greek friend, Anna Levi.Anna Cosadino (Kosadinou) Levi (1895–1981), wife of the art historian and archaeologist Doro Levi (1899–1991). She was born in the Greek section of Istanbul and married Levi in 1928. See Giovanna Bandini, Lettere dall’egeo: Archeologhe italiane tra 1900 e 1950 (Florence: Giunti, 2003), 92n29 and 122n3. Her husbandTeodoro (“Doro”) Davide Levi (1899–1991), an Italian art historian and archaeologist. is a very distinguished archaeologist, Univ. professor, who has done a lot of digging in Crete, Mesopotamia etc etc. She was Anna Cosadino, of the family (orig. Gozzadini from Bologna) who were Lords of Keos (one of the Cyclades) from the 13th cent, until the Greek Independence. She has a marvellous eye for a work of art, and is a person of great distinction in all sorts of ways. They live 18 via Andrea da Castagno, Tel. 51234. I’ve written them that you may call up. She would show you the sort of things we like in the Bargello, the Opera del Duomo, the Laurenziana. She speaks excellent English.Royall Tyler to Mildred Barnes Bliss, March 27, 1936. In Rome, I think you should spend some hours looking at the great brick buildings, ruins most of them, of the IIe–IIIe–IVe centuries, for it was out of them that came Santa Sophia. The baths of Caracalla, the so-called Minerva Medica (by the railway track, about 2 kilom. outside the Termini station, on the R. hand side leaving the station) and the Basilica of Constantine in the Forum. Of course you must also see the Mosaics of Sta. Maria Maggiore, SS. Cosme and Damiano, Sta. Pudenziana, The Lateran Baptistry, Sta. Prassède—and, among the IXe Cent. Roman mosaics—poor lot on the whole—Sta. Maria in Navicella (or in Domnica). Among the museums, don’t miss the little Museo Barracco, where there is A 1 Greek sculpture, and some Byz. slabs allied to the one you got at Stora’s.BZ.1936.44. In Naples, see the mosaics in the Cath. baptistery, and the chancel slabs in the little chapel of Sant’ Aspreno (now in the Bourse), and a carving in a side chapel of Sta. Maria Maggiore, allied to your (Stora) peacock.BZ.1936.19. Apse, group at work on scaffold, July 10, 1936, HS.BIA.0097, The Byzantine Institute and Dumbarton Oaks Fieldwork Records and Papers, ca. late 1920s–2000s, Image Collections and Fieldwork Archives, Dumbarton Oaks, Trustees for Harvard University, Washington, D.C. The Blisses sailed to the United States from Naples on April 28. It is infinitely distressing to see Edith fading away. Elisina is standing it well, but she looks pretty thin, & I’m a bit anxious. But, at this time, she couldn’t stand being anywhere else. As you may imagine, there are constantly questions coming up about the place at St. Brice, the place at Hyères, which it would be extremely dangerous to have Edith worried about, but which would fatally be taken to her if Elisina were not here. As it is, Edith is quiet & happy & comfortable, not suffering, not worrying. The prospect now is that unless the whole sum which was the object of the settlement above referred to goes to Elisina, the result of her having been appointed residuary legatee by E. W. will be to involve Elisina in a financial loss, even allowing for what Elisina stands to get under the American residuary legateeship. Bill will stand to receive from his parents less than he would have received had E. W. not mentioned Elisina in her will. And now, my dear, for Elisina. The picture you have drawn catches me at the throat. The finality of the milestone passed is frightening and seems to put one into another gear. How one wishes none of this wretched business had been!—How one regrets the price. How twisted and unhappy it all is and how different from what poor Edith would have wished. I am thankful to learn from B.F. that a settlement has been reached on a fifty-fifty basis which I suppose is not thoroughly satisfactory to either party but it is better than uncertainties, and to have the chapter closed was desirable. Now that I know Elisina is convalescing and able to have a friend or two stop with her, and by going slowly enjoy a portion of the day, I shall write her again but not dwell too much on what has befallen her even by implication, and you will keep me well informed, won’t you, of any change that occurs. Throughout this period, Royall Tyler and Hayford Peirce worked on the third and fourth volumes of their proposed five-volume edition, L’art byzantin, which, like the first two volumes, were to be published by the Librairie de France. By January 1937, the completed text of the third volume had been edited and prepared in galley proofs and the plates had been printed. But by August 1937, the Librairie de France had gone out of business due to the Depression and its stock was taken over by the Librairie Gründ. This transition put plans for the publication on hold, and with the eventual outbreak of war, the possibility of bringing the book to publication became increasingly less certain. In 1940, Hypérion bought the rights to publish a second edition of L’art byzantin that combined the first three volumes, and the publishing house planned to offer this combined edition in French, English, and German versions. But the fact that the plates were impounded in Occupied France and that their exact whereabouts were unknown also made this plan impossible. No further volumes of L’art byzantin would be published. Unexpectedly, after twenty-two years, in January 1937, the Public Record Office of the British Home Office in London decided to revive the Spanish Calendar of State Papers project and sent Royall Tyler the proofs for the twelfth volume, January–July 1554. But again due to world conditions, this volume would not be published until 1949. The thirteenth and last volume, July 1554–November 1558, would be published posthumously in 1954. 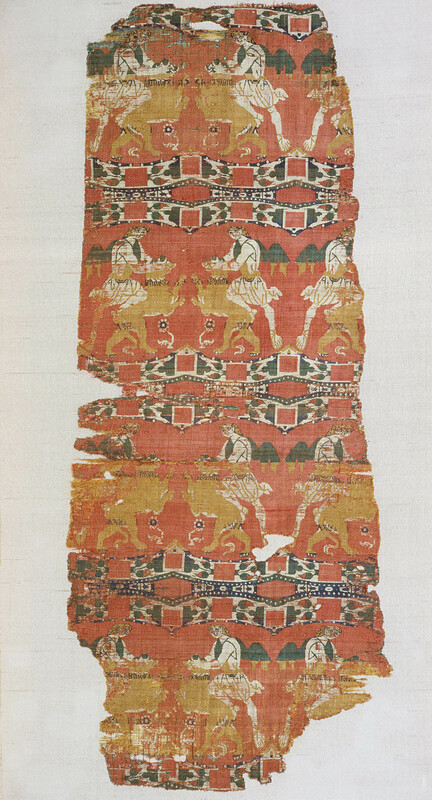 Elephant Tamer Textile Fragment, BZ.1927.1, Byzantine Collection, Dumbarton Oaks Museum. We are delighted and touched that you were willing to make the great effort of writing the first paper. As for the signature, . . . I wondered if Hayford himself wouldn’t see, and be rather amused and touched than otherwise, that we wanted, for sheer sentiment’s sake, to have Dumbarton Oaks make its first bow to the reading public over your signature alone—just this once. What do you think? Would he understand or would he be hurt? Royall Tyler was steadfast, however. He and Hayford Peirce had spent over ten years acquiring, studying, and publishing Byzantine art together, and he wanted to see both of their names in the inaugural volume of the Dumbarton Oaks Papers. In doing this, he saw that their joint contribution to the publication would signal the culmination of their friendship and teamwork and represent the pinnacle of their association with the Blisses, their Byzantine collection, and their research institution, which they had been instrumental in helping to create. Tyler wrote to Mildred Bliss: “But I hope very much you’ll agree to the paper being done by the Old Firm. In effect, it will all be mine—but . . . you know how one feels.”Royall Tyler to Mildred Barnes Bliss, July 10, 1938.